And this haunts me. When longing for peace I tell myself that in order to have it I have to accept that as I check off things from my to-do list, I will always be adding things, and that won’t end until I’m dead. That said, I love checking things off my to-do list. I’m meeting with a lawyer at my publisher today. I enjoy discussing legal issues, they’re like fun puzzles, but I’m sure that I will walk out of that meeting with a longer list of things to do. And the list of things to do with this book is already rather large. You’re not done when you finish the book. – Put together list of fun events, ie, seances, EVP recording at a haunted house, etc. – Write pitch for a local haunted house story. – Come up with a couple of lectures/presentations. – Put together a list of possible colleges (and other organizations, societies, etc.) who might be interested in a lecture or panel. – Come up with ideas for YouTube video. – Explore how to use Facebook to promote book. And Twitter. 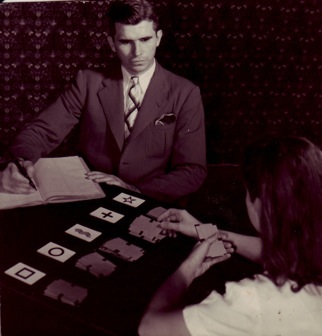 The picture is of J.B. Rhine, the head of the Duke Parapsychology Lab. He was a handsome, alternately intense/sweet man.